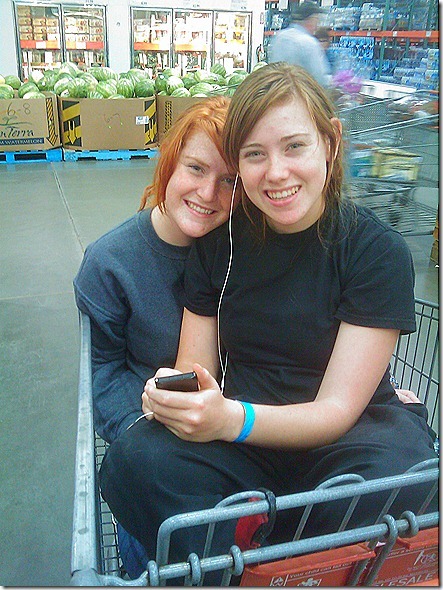 I have to admit that it was a lot of fun to see people’s reactions at seeing two nearly grown girls squished in there. The other (much smaller) children were delighted. Most of them giggled and returned the waves that KT and Mimi gave to them. The adults…well…some of them looked at my teens in disgust, but most of them just grinned. I think they secretly wanted to be chauffeured around too. This entry was posted in Adventures, Family, KT, Mimi, Outside the box, Teens and tagged Costco, graduation, riding in shopping cart, sisters, teenagers. Bookmark the permalink. Fantastic photo of the girls. I think it is a perfect way to celebrate the end of an era. I LOVE this…I could totally see my grown children doing this, and it made me smile. Thanks for that! Graduation.. woohoo! Congrats to your daughter! If they’re anything like my friends then they will be doing those kinds of things well into college. Where did you put the groceries?! Oh that’s funny! I could see my girls doing the same thing. Only they would be arguing the whole time. My kids would be giggling at your girls too. So cute! where did you put your purchases ha ha.